Opened in 2003, Scuba Seraya is a small, comfortable and very peaceful resort, situated 3 kilometres outside the town of Tulamben in northeastern Bali. 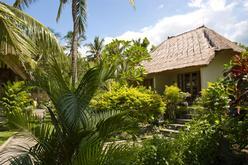 The resort is situated right next to the sea and has its own small but private beach. The hushed sound of the waves will lull you to sleep from your bed! There is a choice of accommodation between semi-detached Maisonette Rooms and individual and very spacious Ocean View Villas. The eight Maisonette Rooms and four Ocean View Villas are set in immaculately kept gardens full of waving palm trees and pink and white bougainvillea. Maisonette Rooms have an air-conditioned bedroom, a large outdoor semi-open bathroom with a shower and very large, deep bath. Maisonette Rooms all have a front porch with a single day bed. Ocean View Villas have a large bedroom with attached bathroom, a private garden with marble-lined hot tub and a kitchenette area with refrigerator and kettle along with a large day bed in a separate covered area of the garden. All these rooms look out onto the ocean. The small open-air restaurant is located in the middle of the resort. There is a good choice of western and eastern food from the ‘a la carte’ menu. Cool, fresh juices are well worth sampling, though the best place to enjoy a pre-dinner drink is the beach front patio where shaded tables make a great location to review the day’s images and sample the local brew, Bintang. The restaurant is open from 0700 to 2200. The resort offers a massage service and these are usually enjoyed outdoors, either by the very pleasant swimming pool or on the dedicated massage tables, right by the sea and surrounded by leafy trees and bushes. Every evening the resort staff make small flower arrangements and place incense on the paths around the gardens. 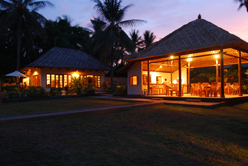 Scuba Seraya offer superb diving and lovely, welcoming accommodation. 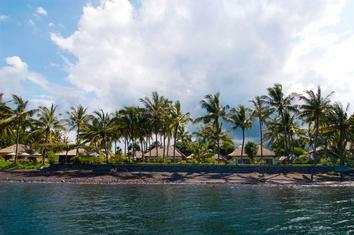 A truly superb choice for the diver or the non-diver who is happy to relax and enjoy the Balinese ambience. The resort has its own dive centre and offers diving in the Tulamben region, including the Liberty Wreck (which is much more conveniently dived from a boat, rather than from the stony beach). There are two small and fast speedboats used for local boat dives, all of which are within 10 minutes of the resort. These are not shaded. Entry into the water is done by backwards roll and ladders are provided for exits. You will usually return to the resort between dives. Guided shore diving is available and the guides are extremely good at finding creatures on your wish list. You can also opt for unlimited unguided shore diving. Towels and water are available at the dive shop. The dive shop has a dedicated camera rinse tank as well as two gear rinse tanks. Nitrox is available. We also offer a special rate for unlimited shore diving at the resort. Please contact us to tailor a dive package to suit you. Stays can be of any length. Upgrades to other room types are available: Please contact us. Reduced rates are available for non-divers.